June 1, 2016 — Yesterday, after months of planning and many midnights of terrified self-doubt, I opened the OTIS Club for membership. And the immediate response was…extremely gratifying. That’s all thanks to a few dozen kind, brave souls who either joined immediately or spread the word for me. But I’m not going to give the whole OTIS Club pitch here. You can go to Patreon to learn about the perks and the OTIS Newsletter Thing and what the club’s all about. Here, I wanted to give you some answers, whether you’re in the OTIS Club or not, to some of the questions I’ve been asking myself since the idea of the club first formed. After all, in this case, I’m not asking you to read some words I wrote about a giant steel statue of God’s mom in Delaware. I’m asking you to pay for something. Like, every month. With money you could spend on other things. For instance, this three-foot-tall Slimer. Why Start the OTIS Club? As of today, OTIS has been on the web for nine years. That means I’m on the edge of that inevitable re-evaluation that comes from major anniversaries. And a decade of doing the same thing definitely calls for some re-evaluation. Don’t get me wrong. I love visiting oddities. But how much do I love blogging about them? I don’t know. I know that I’ve put off a lot of other writing projects because of OTIS. I also know that I’ve garnered a lot of cool writing projects because of OTIS. But regardless, OTIS is always there, always needing to be updated, and usually giving the minimum of return per post. My re-evaluation basically boiled down to this question, “Do I want to stop OTIS, do less OTIS, or do more OTIS.” Spoiler alert: The first two end the same. So I parsed that. And I realized that while visiting oddities excites me intrinsically, blogging about them only excites me inasmuch as it connects me to likeminded people. So I thought, how could I do more OTIS in a way that I could get more of the latter? The socials have sort of filled that need in the past. But with Facebook greatly restricting the number of followers who see posts on the OTIS Facebook Page and the other socials having their own drawbacks and limitations, they’ve lost some of their luster for this purpose. And that’s how the idea of the OTIS Club formed. An inner circle of OTIS readers whom I connect with in ways beyond hitting post buttons on websites and social media platforms. And that’s what I want the OTIS Club to be. A way to connect, and something that anybody who wants to can have a stake in. Why Are You Charging for Membership? Yuck. Okay, let’s talk about that. It’s not a money issue. I don’t have sudden hospital bills or a leaky roof or a strong desire for a top-of-the-line laptop or whatever the reasons I see these kind of campaigns launched all the time. But there are reasons. First, I want to continue OTIS as it is: A way for me to post about oddities that anybody can access. So whatever the OTIS Club was going to be, it needed to be in addition to that (i.e., the “More OTIS” option). So that means more work and more time invested for me and therefore less into other things, both personal and public. Basically, it’s really going to cut into my getting drunk on port and playing Jurassic Park Builder deep into the night. So I can only excuse that by charging membership dues. Second, there’s a validation aspect to it. If you’re in the club, it means you’re paying dues. And that means you demonstrably value it. Which goes far in motivating and inspiring me. I don’t have to feel like I’m throwing words and pictures into the void so much. Instead, I’m fulfilling commitments that I, in turn, value. Third, it gives you more rights as a reader, as well as a stake in the club. I now owe you. So you can rightfully expect (and demand) things of me, determine the course of the club, and take pride in it as your own. How Does the OTIS Club Change OTIS? 2. The Halloween Season Blog: I’m still doing daily posts on all things black and orange in September and October—less than 3.5 months to go until that kicks off (can…not…wait). 3. OTIS Archives: Everybody has free access to my massive back catalog of posts covering thousands of oddities. 1. 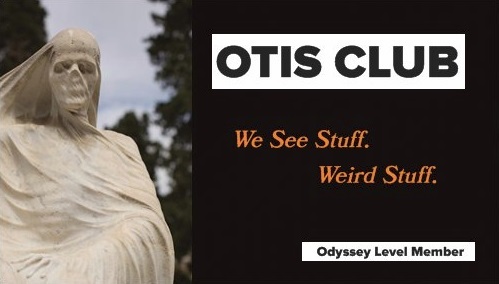 Oddity News: The personally curated stories on oddities from around the web that I used to post on Facebook and the front page of OTIS every day now go exclusively into the weekly OTIS Club Newsletter Thing, along with original content. 2. Social Media: I’ll still be in all the usual places, but I will be the most active on the OTIS Club Instagram account when it comes to photo content. 3. New Content: Now OTIS is only maybe a third of the story of my life o’ oddity. Another third goes to my books, while the final third takes place in the OTIS Club. 4. OTIS Map of Oddities: This interactive map of the U.S. that I use to plan oddity jaunts and track oddities I’ve been to used to be free on the site, and now only certain levels of membership have access to it. We’ll see how things go. There are enough members already to keep this thing going for a while, but it’s still to be seen if they find the club valuable enough to stick with it. For those of you unsure, I say try it for two months. You can always cancel. So to all the members of the OTIS Club, my sincere thanks. And to all the regular OTIS readers, my sincere thanks.